Kandla, also known as the Deendayal Port Trust (Gujarati: કંડલા) is a seaport in Kutch District of Gujarat state in western India, near the city of Gandhidham. Located on the Gulf of Kutch, it is one of major ports on west coast. Kandla was constructed in the 1950s as the chief seaport serving western India, after the partition of India from Pakistan left the port of Karachi in Pakistan. The Port of Deendayal is located on the Gulf of Kutch on the northwestern coast of India some 256 nautical miles southeast of the Port of Karachi in Pakistan and over 430 nautical miles north-northwest of the Port of Mumbai (Bombay). It is the largest port of India by volume of cargo handled. Kandla history Deendayal Port Trust, India's busiest major port in recent years, is gearing to add substantial cargo handling capacity with private sector participation. The west coast port handled 72,225 million tonnes of cargo in 2008-09, over 11% more than 64,920 million tonnes handled in 2007-08. Even as much of this growth has come from handling of crude oil imports, mainly for Essar Oil's Vadinar refinery in Gujarat, the port is also taking measures to boost non-POL cargo. Last fiscal, POL traffic accounted for 63 per cent of the total cargo handled at Deendayal Port, as against 59% in 2007-08. 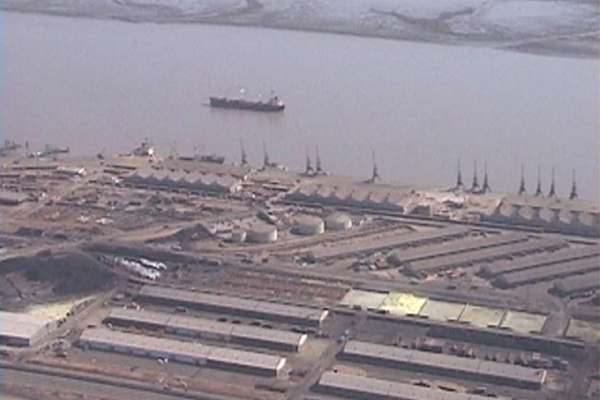 Although Deendayal Port Trust officials declined to elaborate given the ongoing election code of conduct, it is reliably learnt that the port will soon initiate the process of selecting developers for four clean cargo berths that together aim to handle 8 million tonnes of cargo. The four berths will be supported by a 14 m draft capable of handling 75,000 dwt vessels. The port has already received encouraging response from prospective bidders, for the project that is estimated to cost nearly 5,000 million INR.